Hidden in the winding streets of the Bishop Arts District is a small house painted a deep red that is home to Red Pegasus Comics. The color, size and name all piqued my interest, so I pulled over to check it out. What I found inside were shelves upon shelves of comic books and Funko Pop figures that lined the walls. Owner and operator Kenneth Denson was friendly and engaging, and when another guest walked in, he greeted him by name. This was the most welcoming comic shop I had ever been in. Red Pegasus Comics was started in November 2014 by Denson and his husband, Gabriel Mendez. Denson quit his corporate job upon realizing he was growing to hate it, and he and Mendez searched for a business that Oak Cliff was lacking. Thus, Red Pegasus Comics was born. Red Pegasus Comics started as a popup shop and found a permanent home in April 2015. It was named “Best Comic Book Shop in the Big D” for 2016 by the Dallas Observer. The Oak Cliff Chamber of Commerce also named it the Best Business of the Year. 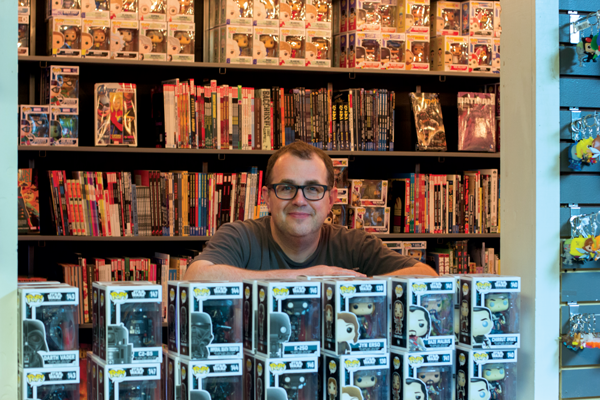 Though space is limited, the shop houses about 15,000 comics. Its vast collection contains publications from Marvel, DC and other publishers as well as Funko Pop figurines from all the geek fandoms. When you first walk in, it might be overwhelming to see all the comics on the walls, but Red Pegasus Comics makes finding the right comic book easy. “Nobody should have to pass a test to go to a comic book shop,” Denson said. What makes this shop special is that if it doesn’t have the comic book you are looking for, Denson will special order just about anything from his distributors. While the shop doesn’t carry manga, getting what you want is only a couple clicks away. Red Pegasus Comics is located at 208 W. Eighth St. in Dallas.